"This is a great fall dish. Roasted veggies sit on a bed of spaghetti squash and are topped with a little melted cheese. Note: vegetables can easily be substituted. I have made this many times with whatever is on hand. However, when I can, I try to use mostly root vegetables in yellow and orange colors." Preheat oven to 400 degrees F (205 degrees C). Coat a large baking sheet with cooking spray. Place spaghetti squash and acorn squash, cut sides down, on baking sheet. Place sweet potato on baking sheet. Bake until squash and sweet potato are tender when pierced by a fork, about 45 minutes. Turn oven down to 350 degrees (170 degrees C). Coat a 9x13 baking dish with cooking spray. Scrape strands from the spaghetti squash and place into prepared pan in an even layer. Cut sweet potato into bite-size chunks; place into a large bowl. Scoop bite-size chunks of flesh from the acorn squash; add to bowl. Stir baby carrots, diced onion, honey, cinnamon, salt, and black pepper into squash mixture and mix well. Transfer squash mixture to the baking pan and spread evenly over spaghetti squash. Sprinkle Cheddar cheese over the top. Bake at 350 degrees until cheese is bubbly and brown, about 45 minutes. 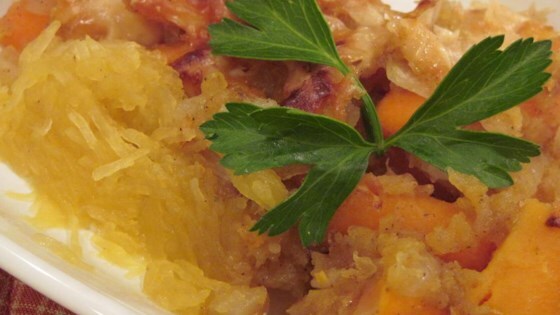 See how to make scrumptious spaghetti squash “spaghetti."